BUNDRED REPORT: ARE THE WHEELS COMING OFF? While the rest of the media produced a PERFUNCTORY news report and crawled back under their stone; while councillors acted DUMB and couldn’t even be arsed to demand a debate about it and while the public continue to be UP IN ARMS about it … The BRISTOLIAN is driving forward the agenda around the Bundred Report. And the Rev Rees knows it! Following our demands for an investigation into the conduct of his chief officers and managers over their handling of last year’s budget – especially THE CONSPIRACY identified by Steve “Sticky” Bundred to provide councillors with deliberately MISLEADING savings figures – the Reverend has conceded that further investigations are necessary. Rees agreed to our demands today after he was confronted by protestors in the Council Chamber during his budget meeting. He promised the protestors a new inquiry into “how the failings actually took place” and admitted his senior bosses knew that the savings they presented in last year’s budget were “UNACHIEVABLE”. Most significantly Rees admitted last year’s budget was “ILLEGAL” just days after his Monitoring Officer told us, “the report does not imply any criminal act”! Will the Reverend call the cops then? Regardless – we’re winning! But rest assured we’ll keep the pressure up and get this whole current shower of dishonest, disreputable overpaid and underperforming council management crooks and tosspots investigated. 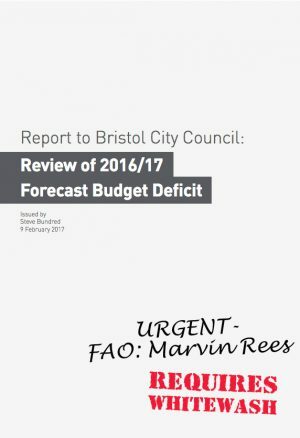 This entry was posted in Bristol City Council, Budget 2016, Marvin Rees, News and tagged Bristol City Council, Marvin Rees, Monitoring Officer, Shahzia Daya, Steve Bundred on February 21, 2017 by thebristolblogger.